Closed for the Winter season. See you in the Spring. 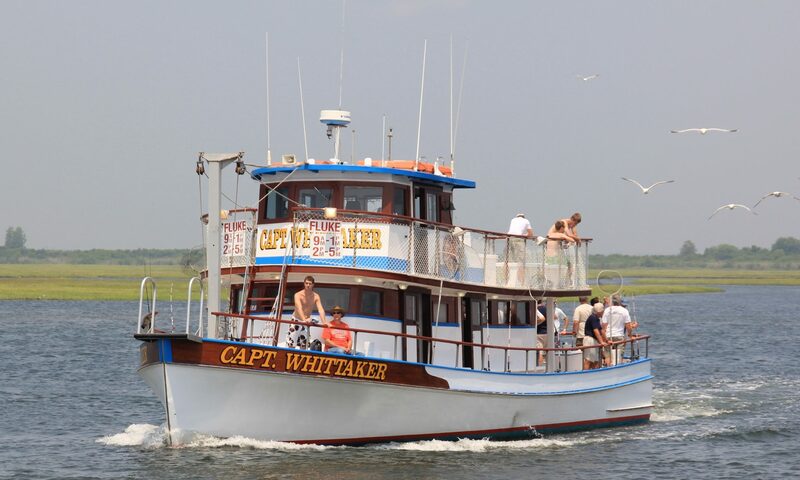 The Captain Whittaker is an open to the Public, 65 foot Fishing Boat, sailing from Captree State Park Marina. Fishing, Relaxing, Breathing the Ocean Air – a Special Time for All, Fisherman to Families Welcome. The Captain Whittaker has been fishing the waters around Captree State Park for over 40 years. The Whittaker is a Fully Equipped Fishing Boat designed to Fish Safely and Comfortably in these waters. She features Sparkling Clean Ladies and Mens Bathrooms and a Coffee and Snack Bar for a Fun Comfortable Trip. Come Fishing with Capt Rick for a Great Fishing Trip! The Whittaker offers a Special 1st Time and Family Captree Fishing Cruise at 2pm every day! The Trip is a Child Friendly 3 Hours, providing Ample Time to Fish and Relax with Your Kids. On Captain Whittaker Cruises, we Provide All the Gear You Need to Fish and Enjoy; Poles, Nets, Bait and Hooks. Our Mates are on Deck with You every Step of the Way, Showing You Our Secrets to Fun Fishing. Please take a look at out Trip Advisor reviews of fishing on the Captain Whittaker. So, come on down for some Captree Fishing Fun!